Instruction For Use: Use as a condiment for Korean cuisine. 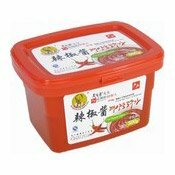 Store in a cool and dry place, keep refrigerated and use within 1 month after opening. Ingredients: Wheat Flour (26%), Maltose, Chilli (35%), Water, Glutinous Rice, Cooking Wine (Potato, Water, Yeast), Flavour Enhancer (E635), Preservative (E202). Simply enter your details below and we will send you an e-mail when “Korean Style Hot Pepper Paste (Gochujang) (韓國辣椒醬)” is back in stock!